Too much sulfur? Or just "wonderfully dirty"? Yes, it has sulfur components, that's undeniable. But sulfur is not just sulfur and its existence does not make a whisky a bad or even "dirty" whisky. 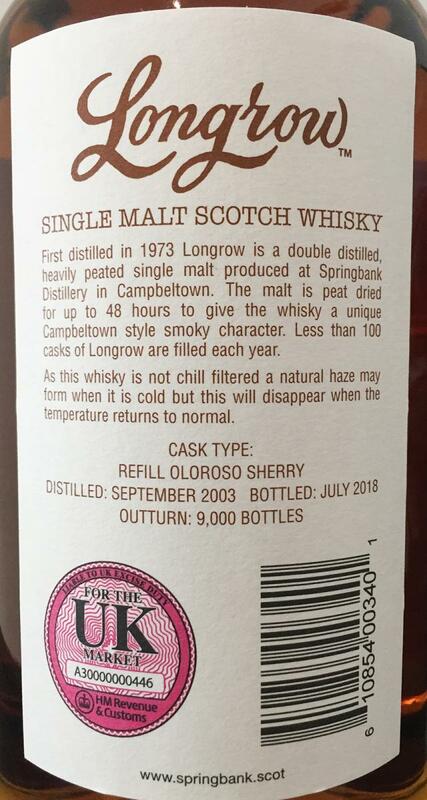 In an elegant Speysider one would perhaps be able to call a note of sulfur a false note, to a filling of Longrow, in which "elegance" is probably not a desired characteristic, fits this note but perfectly. In no case is he "over". Old leather, tobacco leaves, black cherries, overripe red grapes and above all pleasant BBQ smoke. Just touched match. Damp forest floor, fine herbs and spices. Dry onset with intense, cold smoke. Again the canned cherries, the very ripe red grapes. A good shot of bitter honey, men's chocolate. Pebble taste. The smoke, intense at the beginning, continues to turn with time, then accompanied by the smell of a just touched match (removed, in the next room). Over time, salt liquorice and spices come forward, thyme and rosemary. Pepper supports the spicy impression. Medium long, dry and smoky. Liquorice, salty, The dark fruit from the nose and the palate are just a clue. Phew, very difficult part! Where should I start? The high-potency alcohol content (57.8%) initially stings quite clearly in the nose, but it evaporates after a while, after all, a little. 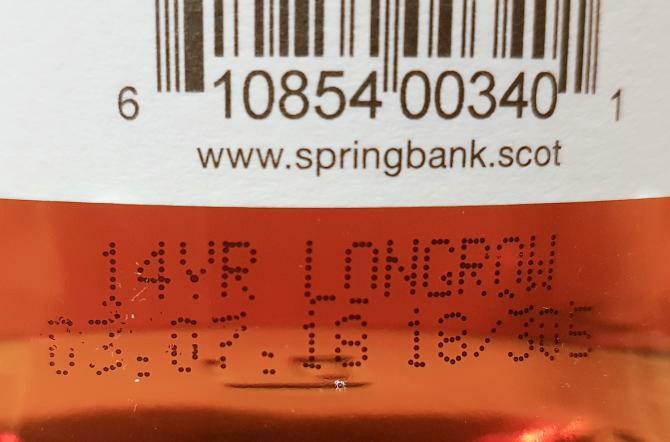 The Longrow has a vivacious sulfur note, which absolutely displeases me in this intensity. For some malts, such as the Glen Garioch 15 years, I feel a subtle sulfur flavor even relatively interesting and complexity-expanding, if it remains at a nuance. I let the malt breathe for some time (30-45 minutes). The otherwise so striking Longrow smoke (smokehouse, light bacon) behaves surprisingly very discreet, more of a slight smoky note is noticeable. Salty caramel sweets, sherry notes, red fruits, strawberries, overripe apples, chocolate, leather and hints of spicy oak gradually crystallize out. After a long time in the glass the malt looks sweeter and more fruity, the sulfur note fades a bit, but for me it is undoubtedly perceptible. A dirty scooter before the Lord - you just have to say it that way. Strong, slightly sharp onset, the strong alcohol emits instant warmth on the palate. After 10-15 seconds slightly astringent in the mouth. Dirty smokehouse smoke, sulfur, forest honey, slightly rotten apples, raisins, soft cake (orange & chocolate), salty caramel and spicy oak I perceive. I find it incredibly difficult to classify the malt, but for me it looks a little younger in terms of taste than its almost 15 years. Maybe it's the sulfur note? Medium long, slightly smoky, spicy and sulphurous. Light smokehouse smoke is quickly replaced by pepper, sherry aromas and intense chocolate notes. On the palate remain sulfur and a noticeable dryness. Nice drop with good mixture of smoke, sherry and sulfur. Dirty and tasty. For some maybe a bit too dirty but I like that and the missing depth / variety is the only criticism. Nice dirty. Old leather, subtle sulfur, a pinch of salt and nice spicy black pepper, greasy smoke, some caramel and red fruits from the sherry barrels, even oak is noticeable with a fine chocolate note and some wood. Prune wrapped in bacon, sulfur and spicy smoke, beautiful sherry sweetness with smoke and sulfur touch, the oak brings dark chocolate. Finish is medium long. Warming smoke and baking plum remain the longest. If you can not handle sulfur - keep your hands off. If you do not care about that, it can be quite good. For my taste that is already a nuance too much. So many will say that the "really cool is dirty"
Edit: The more I drink it, the worse the sulfur effect. Especially in taste and on the finish. No real enjoyment. 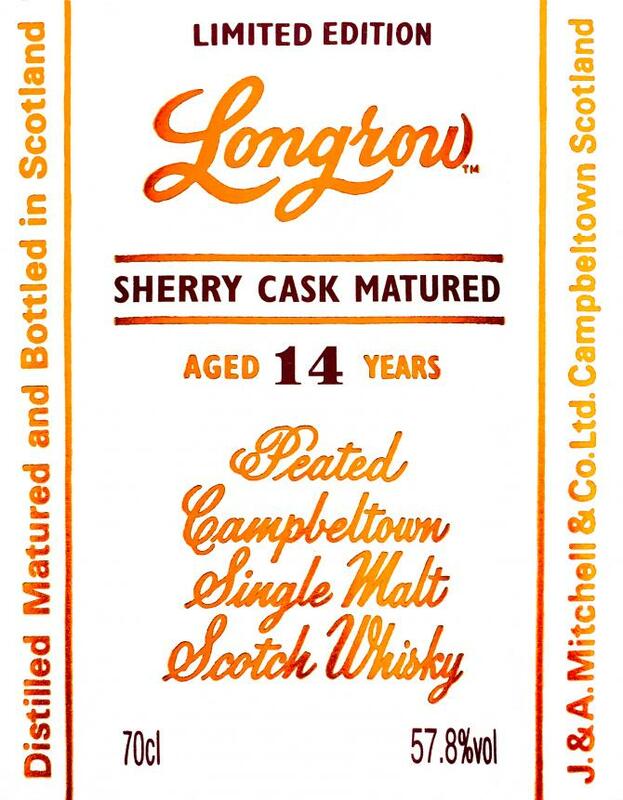 Only 100 casks of Longrow are filled each year of which the majority goes into sulphur casks. Terribly frustrating. What a malt! Dangerously dirty like brackish water, coastal and pretty much sulfur! Take bacon, seafish, lemon and salt, throw it on the grill and try to drink! Pretty crazy but still cool! Red fermented fruits, kombucha and plums are all about pleasant peat smoke, which is the first thing I notice. All in all very strong and maritime and there it is, the burned match, which intensifies with each breath. I take away some chocolate, honey and herbs. The sulfur, however, overlaps more and more. 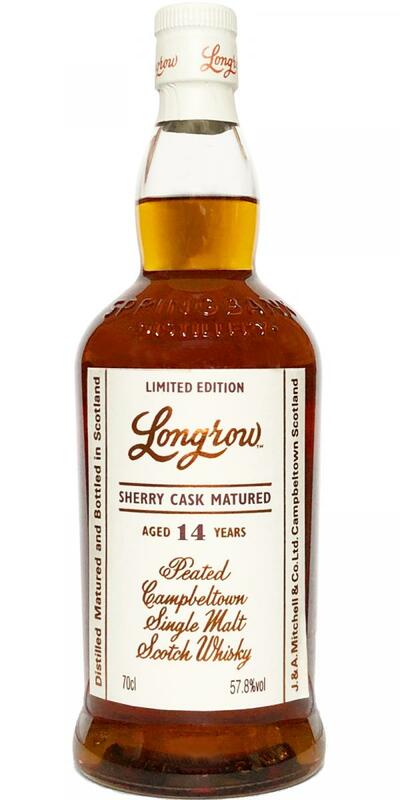 Violent in the beginning and at the same time full on the tongue this Longrow transports a clear sweetness, which I did not expect on the basis of the nose. There are ginger, cocoa, old kiwi, plums, fermented fruits, grapefruit, cloves and maritime peat smoke. Unfortunately, this almost overpowering note of sulfur lies above everything again. Unfortunately, water only adds sulfur to the sulfur note. Sulfur, smoke, black pepper, orange peel and deep black dark chocolate. Conclusion: What kind of barrels were that ???? Too much sulfur, as if I had just put a whole pack of spent matches in my mouth. Great, who likes it, I do not like it at all. But with the amount of sulfur you have to assume the distillery almost intent, this whisky should taste just like that. But I still see that as a false note, even if there are lovers for it. Unfortunately, if you omit the sulfur, the malt also lacks a certain amount of complexity to really score points. 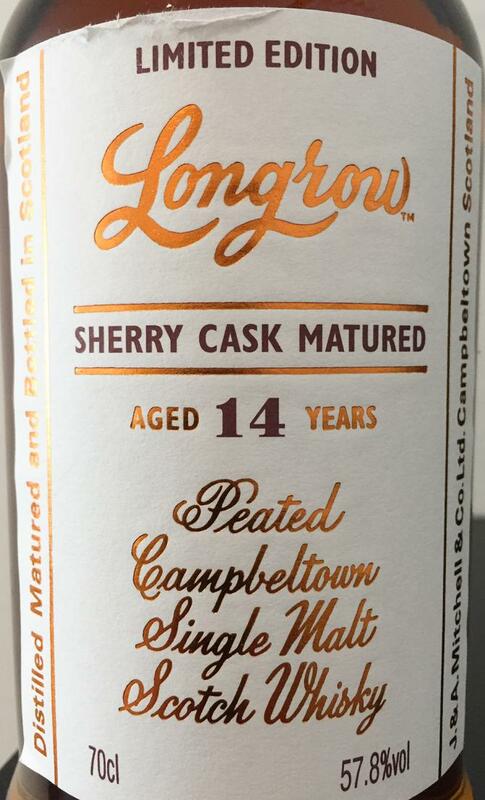 Unfortunately, a Longrow to get used to - at least for me. Burnt wood and unfortunately, burnt plastic smell also. A detectable amount of sulfur -- I guess there's a reason there was a rather large vat of this... they needed to get rid of a number of faulty casks. I am not going to be kind. This is unbalanced, has a very weird sweet smoky taste, and lots of sulfur. I am not against sulfur per se but when it's the dominant flavor in a background of other lesser flavors, I would say this shouldn't have been bottled. I have a 2 oz sample of this and it's gonna be difficult to even finish 1 oz. It's a sulfuric mess. Shame on them. Not much redeeming quality from start to finish, I'm afraid. No, thank you. This is the reason why I try to stick with bourbon cask springbanks and longrows for the most part.